E. coli detection, candy making, healthier cookies and nutrient testing, this is all part of a normal week for the attending educators at the Food and Nutrition Science Institute. 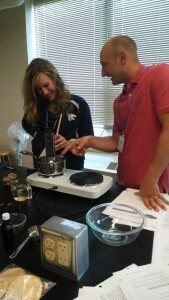 FNS Institute provides family and consumer sciences and agricultural education teachers with project-based, scientifically rigorous, food and nutrition science curriculum for high school students. K-State was selected as one of three field test sites for new curriculum being developed by the CASE Institute in the area of Agricultural Power and Technology (APT). 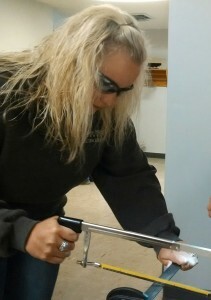 Lauren Van Allen (’12) puts her practical skills to test during CASE Institute training. 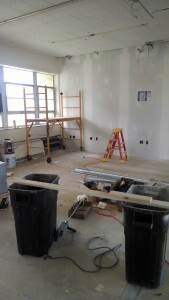 Construction on a third floor project in of Umberger Hall should to be complete for the start of the 2015 fall semester. “We want to bring all of the academic program functions to one collaborative area,” say Gina Nixon, business manager for the Department of Communications and Agricultural Education and project coordinator for the construction. 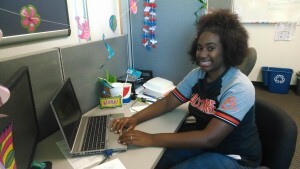 My name is Iyonna Campbell, I am a junior at the University of Maryland Eastern Shore. Ioynna Campell works on her research project. See you in Scottsdale for AMS! 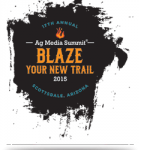 We look forward to seeing our alumni and friends at the 17th annual Agricultural Media Summit! This year, four ACJ students and one graduate student will attend the summit in Scottsdale, Arizona, July 25-29.